This product is intended to be used with Reading Street series. 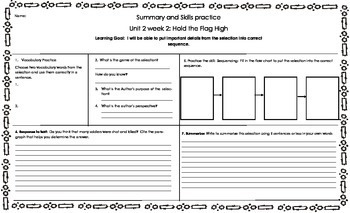 My skills and summaries will provide students with opportunities to practice the weekly skill in a graphic organizer, practice using vocabulary words in context, identify the genre, author's purpose and perspective, answer a response to text question, and summarize the text in their own words. This can be done individually or as a class while reading the selection. The document itself is sized at 14" X 8.5" so make sure you are printing on legal-sized paper. When printing, make sure you select the "actual size" selection or this document will shrink to fit on an 8.5 x 11 sized paper. This will not allow the students adequate room to write and respond.